Agency Adding Value selects luxury Athenian resort for car giant's annual 'top achievers' reward. Pre-event planning: Adding Value won a tightly contested four-way pitch to host the event, and set about choosing a destination offering value for the client with a decent May climate. During the run-up, as well as site visits, Adding Value were also charged with handling all the internal promotional communications, ranging from the launch of the awards themselves to teaser campaigns to promote them. Objectives: The event takes place annually and features a series of awards aimed at driving after-sales across the UK dealer network, and recognising the company's top achievers. Peugeot wanted a strong mix of activities for all the attendees and their partners, as well as free time for people to explore the destination themselves. Challenges: There were several issues facing Tina Morris, managing director of Adding Value, and her team. "The key challenge was financial," she says. "The event had a reduced budget from previous years, though client strategy throughout the economic downturn has been to continue operating incentives and recognising success, even if at a slightly lower level. It's better than nothing at all, as with other manufacturers." The budget constraints challenged her to find alternative hotels to the more established resorts in Vouliagmeni and Cap Sounio. In addition, British Airways cabin crew strikes in May required the creation of a Plan B. "Public protests in Athens also caused anxiety, with a national strike on the day before the event," says Morris. Solutions: New flight arrangements were made with Olympic and Aegean, and UK domestic connections on BMI. "The site visit identified the Plaza Resort at Anavyssos as the best hotel solution," says Roger Parker, director of event operations. "The event programme mixed organised group activity with individual options and time at leisure. 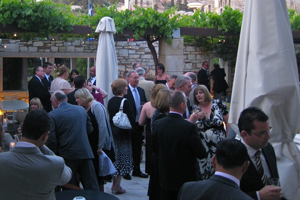 Highlights were the 'white night' party/dinner in the hotel gardens, beach Olympics and an exclusive farewell dinner at Dionysos restaurant, complete with Acropolis view." The five-star hotel is on the Athenian Riviera, and its Gaia Ballroom can easily welcome groups of up to 300 people for a sit-down banquet. Client verdict: Louise Dowling, dealer incentives and events manager for Peugeot, was delighted with the destination, which unexpectedly turned out to be more exotic than she first hoped for. "Greece was somewhere that, surprisingly, most people hadn't visited," she said. She was particularly pleased with the hotel choice. "I made the agency work hard, before and during the site visit, to find the right hotel, with the Plaza proving to be the ideal beachfront retreat. Overall it was a great event and one I'm keen to repeat for another channel." Post-event analysis: Peugeot reported pleasingly high levels of satisfaction from the attendees, saying that everyone had enjoyed the programme and especially the awards themselves. The client confirmed that they would use both the agency and the destination and venues again in the future.